It has been a bit of a trend (or for the yoof’s, a hash-tag) to show your support for celebs by joining up with their ‘team’: be it Team Jessie, Team Nigella, Team Edward… but on Monday night Lucy inducted us into a team that we’d all like to be in, Team Zissou, and her film choice The Life Aquatic. We even had our first fascist to arrive in themed fancy dress, with Matt sporting a very apt beanie hat, and unintentionally possibly setting a trend for another dimension of film interactivity. If only we knew what the film was going to be before the night itself… I’m still waiting for the perfect chance to dust of my velociraptor costume. Mind you, embarrassing fancy dress is the last thing Adam needs when he is lost again in his usual pre-MNFC ritual wanderings. On preparing for this review, I watched segments of the original Cousteau films, which have a certain style and flare about them. A great example is to be found here. However, it is also interesting to think about how nature documentaries have changed over the years, due to improved technologies, animal welfare issues, and general approaches to film-making. The BBC’s Blue Planet series showcases in a very different way the fascinating world beneath the waves. As an aside, this website also made me laugh; there really are some weird things that live ‘under da sea’. But, the question we all want to know is, does Steve Zissou’s nemesis the Jaguar Shark actually exist?… well click here to find out! MNFC loved it however, and on a personal level it really did make me chuckle, particularly the dead pan expressions of Bill Murray and the amazingly dry humour in the dialogue. I also really loved the the very obvious ‘special effects’ – the stop motion effect brought to mind this amazing time-elapse footage of coral reefs which is worth a look. One of the least cynical reviews of the film is here, and I really love what Matt Zoller Seitz has to say about it, in particular how it has helped him deal with grief. It is in this that judging a film on what critics say seems wrong – I think that different films speak to all of us in different ways, in different times in our lives. I have already written in the Tuesday Review of The Shining how critical review can change over time also, so who knows what the future holds? Good luck, Sharknado! It is worth mentioning in particular the work of director Wes Anderson. 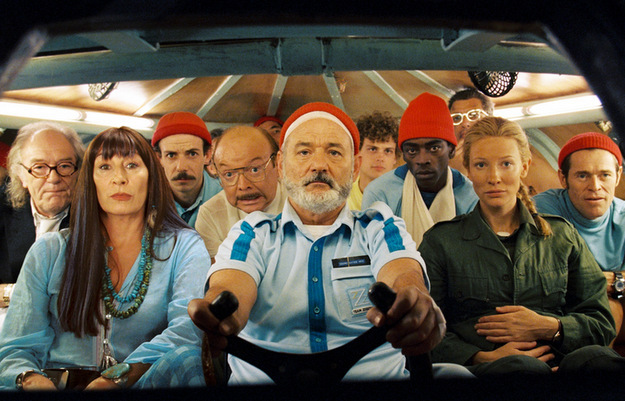 His films have a very particular feel to him and The Life Aquatic is no exception. There are some interesting analyses online of his film, scripts, music, mis-en-scene… If you want to be particularly chin-stroky I would recommend reading this essay on The Life Aquatic; but a summary which proves the point regarding his visual style is here (the You Tube clip is very enlightening). I also like this link where Wes Anderson explains how to make a Wes Anderson film. An almost exclusive use of the Futura font, most often in yellow, but occasionally in black or other primary colors. Sometimes he varies the weight, or italicizes if he’s feeling wacky. An elaborate slow motion shot of a character running, or walking rapidly, often at the end of the film. This is so people don’t miss the character’s facial expression not changing. A montage set to a Rolling Stones song. Not anything popular like “Paint it Black” or “Satisfaction” of course, but you know the Stones album with the song you never listen to? Yeah, it’s that song. Grown up characters seeking the approval of a parental figure. A theme which Wes Anderson’s dad does not approve of and never will. A shot of one the characters under water. It is powerful symbolism, often signifying that the character is very, very wet. It is widely agreed that Wes loves a good bit of slo-mo… and in this video everything except his slow motion shots has been removed from his films, and this is what we are left with! So, the next MNFC will be our 3rd birthday extravaganza! Doesn’t time fly, eh? Until then, I leave you with these amazing underwater sculptures, why it really is better down where it’s wetter, and what to do when the wetsuit just doesn’t really fit anymore. Now if you’ll excuse me, I’m going to go on an overnight drunk, and in 10 days I’m going to set out to write the Tuesday Review. Anyone who wants to tag along is more than welcome.